No matter what business you're in, you are in the business of transformation and the role of your products or services is to move your customers from point A to point B and your role as the marketer of your company is to have an in-depth understanding of what life is like at Point A and what life is like at point B. That way you can communicate your ability to take them on that journey. Getting from point A to point B doesn't have to be some global life-changing event although it certainly can be. Getting your potential customers from being hungry to not hungry. Getting through from feeling tired to be more energized. From having a little bit of money to have it a little bit more money. But how do you convince them, that you are the right person and your products and services are the right offerings to get them from point A to point B. Well, that's what you are going to know about today and I'm going to walk you through a really simple four-step process so that you can create your compelling marketing messaging. But before we jump in I want you to keep something in mind that we're going to use what I call the focus of 1. You have to focus on 1 specific customer, 1 product or service that's going to help them move from point A to point B. You have to focus on 1 medium. So, that's 1 place where you're going to share your marketing message whether it's online, offline, on stage, in person whatever that is we're focusing on 1 product or service, for 1 specific customer, 1 action we want them to take and we're focusing on creating messaging for just 1 medium. You have to identify your ideal target customer, your ideal customers are the group of people with a problem and don't get hung up on the word problem. It could be a need, a want or desire. They know that they have this problem and need one or desire, they're actively seeking a solution to that problem and they can easily afford your most expensive solution to that problem. Your ideal customers are not one group, is not women, it's not men, it's not teachers, it's not doctors, it's not lawyers. You need to be more specific, than that you need to think about who the person or who's most likely to need your specific solution to address their specific problem. What you need to do, is get an in-depth understanding of whatever that most pressing problem need, want or desire is and that's it relates to your business. So, what is the pinpoint there, what's bothering them, what's going to cause them to be searching in the middle of the night for your solution? You need to understand the backward and forwards, you need to understand your ideal customer backward and forwards because you're not going to be able to effectively communicate with them if you don't really have a good understanding of who they are. So, the best way to go about this is once you've come up with a hypothesis as to who you think they are then you need to actually spend some time talking to them. You have to really get inside their brains and if you can find a few people to have some one-on-one conversations with that's some of the best market research and you'll be able to do it. If you're not able to do that then you can also send out a survey to a few people who fit the description of your target customer and you really have to ask some pointed questions to really make sure you understand how they're dealing with that problem, how urgent it is for them to have a solution. You have to really think that you're trying to find out the emotional transformation that you are trying to help them achieve. Your customers don't want to lose weight they want to or maybe boost their confidence. You see the difference they're losing weight is, maybe what you help them do but ultimately what they're looking to do is feel better about themselves. They don't want to make more money. They are looking for more freedom. They are looking to have more choices. They are looking for security. Those are some of the things that money may provide for them. So, you have to look past what it looks like on the surface they need and really get to the emotional transformation that they're trying to make because you have to communicate that with your potential customers. This is the area where you actually get to shine you need to identify that will make you the right person. More than just surface level because you're going to have to convince them. Why they should buy from you and not from someone else. It has to be more than you've been doing this for several years or you're certified and you've got the education behind it. While all that stuff is important that really doesn't differentiate you from anybody else in your industry who may be selling the same products or services as yours. So you've got to get dig deeper into yourself to determine what it is that will provide the trust for them and that says you know what among all these other people who are saying they can help me. With this problem, your potential customers will feel like this person is the right person and it may be that you need to highlight a combination of things. It may be your background, your experience, your education, your testimonials from other customers who you've helped it or may be a combination of that. But it's usually not going to be just one or two things, you really have to make sure you're able to differentiate yourself from your competitors as well. As you start to craft your marketing message and you've gone through the steps you'll have a message that addresses your ideal client in a way that makes them feel you completely understand where they are. You've pinpointed the transformation and described what life is like for them at Point A and what life will be like for them when they make it point B. You've highlighted your expertise so that they understand that you or your company are more capable of solving their problems and relieving the pain or satisfying their desire. Now, it's time to introduce your solution which should be a clear choice and helping them resolve the problem. You can talk about your deliverables and all of this should be laid out. 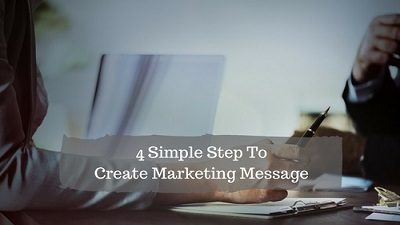 Follow these 4 simple steps and that will be how you craft a compelling marketing message to attract more clients to your business. So, you've got your 4 steps and it's time for you to take some action using our focus on one theory. You have to create a compelling marketing message for 1 customer, about 1 of your product or services and you have to come up with 1 action.